Roots are an important organ of plants that are typically thought of as occurring below the surface of the soil. However, since roots can also occur above the surface of the soil, and since stems can occur below the soil surface, it is not accurate to define roots in this way. A more accurate definition that fits all plants is needed. Therefore, in vascular plants, the root is the part of a plant’s body that does not have leaves (or flowers), and also lacks nodes and internodes. Root systems anchor the plant body in the ground/soil. Roots absorb water and mineral nutrients (dissolved salts) from the soil. Some plants can store food in roots in the form of carbohydrates (sugars and starches). In some plants, roots can produce new plants (propagation). In response to the concentration of nutrients, roots also synthesize cytokinin, a chemical that regulates how fast shoots can grow. Roots will generally grow in any direction where the correct environment of air, mineral nutrients and water exists to meet the plant’s needs. Figure 7.16: A plant root in action. 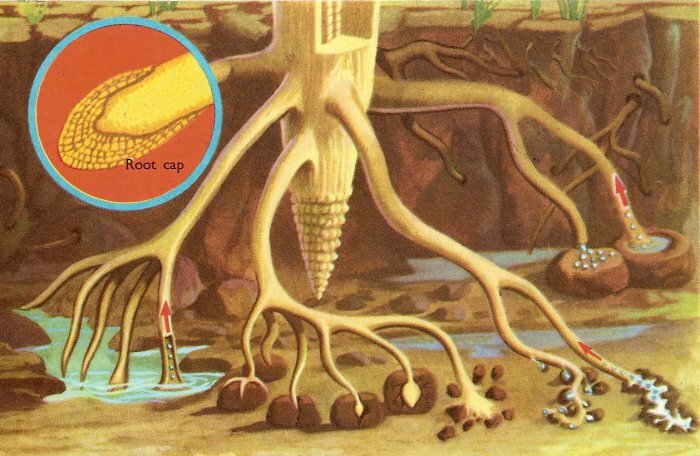 Rootlets bury into the earth, absorbing, by osmosis, water and the mineral substances dissolved in the water. The water is absorbed by a process called osmosis (click here for more on osmosis from the Internet Encyclopedia of Science). The liquid inside the root hairs is a strong solution of sugars and mineral salts; outside them, i.e., the water in the soil, is a weak solution of mineral salts. The outer skin of the root hairs is a semipermeable membrane (click here for more on semipermeable membranes from the Internet Encyclopedia of Science), with the special property of enabling weaker solutions to pass through into stronger ones. So long as the solution inside the root hairs is stronger than that outside, they will take in water. Fibrous root systems (seen in many grasses and some trees like maple and beech). 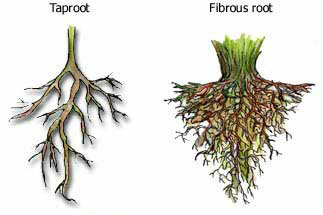 Figure 7.17: Plant root systems: the taproot system and the fibrous root system. Taproot systems consist of one main root with many small branches; are hard and strong; and go deep into the soil. Some trees can also have taproot systems. Pine trees can grow their taproots as far down as 6 meters (about 20 feet). Taproots can be modified for use in storage (usually carbohydrates) such as those found in the sugar beet or carrot. Taproots are also important adaptations for searching for water, as seen in the long taproots of mesquite and poison ivy. Click here to see an image from the EPA of the variety of roots systems found among common prairie plants. In contrast to taproots, fibrous root systems are comprised of many roots of roughly equal size; are soft and delicate; and spread over large areas closer to the surface of the soil. A fibrous root system is universal in monocotyledonous plants and ferns. Weeds that have fibrous root systems can be hard to pull from the ground. Moreover, the weeds may grow back from any roots that were left in the soil. Some fibrous roots are used as storage; for example, sweet potatoes form on fibrous roots. Because of the large mass of roots that form in the fibrous root systems, plants with fibrous roots are excellent for erosion control because the mass of roots clings to soil particles. Many trees begin life with a taproot, but after one to a few years change to a wide-spreading fibrous root system. A typical mature tree 30-50 meters tall has a root system that extends horizontally in all directions as far as the tree is tall or more. However, over 95% of the roots are in the top 50 cm of soil. As we discovered in the soil module, the roots of most vascular plant species form symbiotic relationships with certain fungi to form mycorrhizae. This symbiotic relationship is beneficial to both the plant and the mycorrhizal fungi. The plant benefits from the fungi’s higher absorptive capacity for water and mineral nutrients, while the fungi benefits by having access to carbohydrates, such as glucose and sucrose, supplied by the plant. Mycorrhizal symbiosis occurs in about 80% of all plant species. Some plants such as legumes form symbiotic relationships with specific bacteria that form small swellings or nodules on their roots. These bacteria fix nitrogen, which is an essential element required by all plants (and other organisms). Plants are unable to use nitrogen in its gaseous form but can use the ammonia formed by these nitrogen-fixing bacteria. Like the mycorrhizal associations, the bacteria benefit from this association by having access to the host plant’s carbohydrates. As with other plant parts, the roots of some plants have become modified or specialized (adapted) for special functions besides those already described. 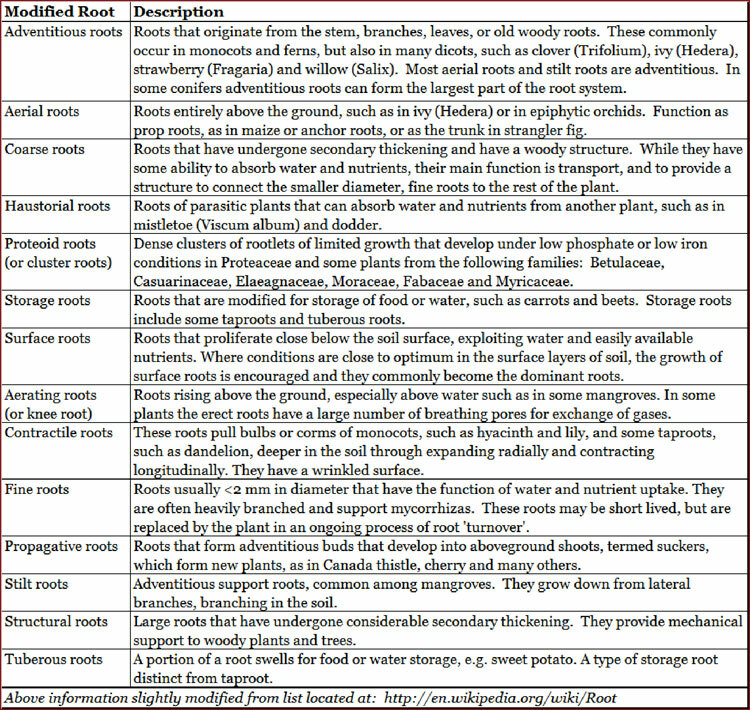 Click here to open a table of some examples of modified roots.